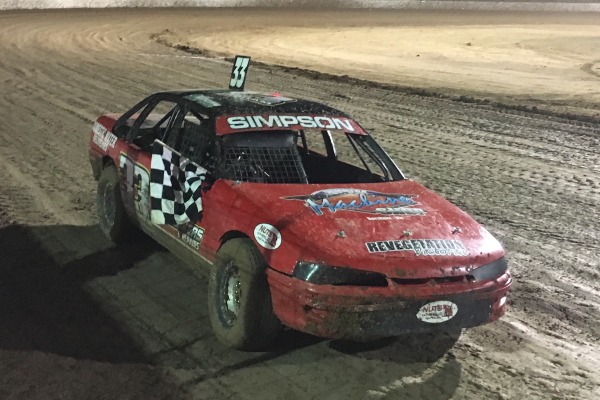 In heat one Simpson showed the depth of his desire with a flag to flag win by 10 second over Jetson followed closely by Chrystie and Gerlach. Heat two saw the cars of Raymont and coming from the back end of the grid to challenge Atkins mid race with Drewett taking the win over Atkins and Raymont with only .03 secs separating them ad West in fourth. In the third heat there was another hard charge from the rear of the field when Martin Hawson took the lead on lap four and held on with Kye Walters in second and Chris Hayden holding off Blackwell by .3 seconds, Hawsons fast lap of 20.334 seconds set the tone for the night. The fourth heat was more of the same with another hard charge from the rear of the field with Simpson off the back row getting to fourth by lap three and with starting and finishing one/two Simpson got the better of Blackwell on the last lap for third after a six lap battle by half a second. Heat five was a runaway win for Darren Cockerill from pole with an eight second gap on a charging Russell Bent .03 seconds ahead of Jetson in third the cooling temperatures saw Cockerill lower the lap time below 20 secs to 19.699. Heat number six line up had the cars of favoured runners Raymont, Walters and Hawson pitted against each other in what was a hard fought battle for the minor placings with Hawson running away with another low time of 19.294 and Walters and Raymont battling for six laps Walters taking second with one to go. Jake Drewett in the MDA 18 charge from the rear of the field in heat seven to take a narrow win over Hawson who fought through the field from last half way through the heat to miss first by half a second with Rachel Pratt five seconds back in third. Daniel Simpson start near the rear of the field in the eighth heat but by lap three was chasing down Matt Nelson and eventually taking the lead on lap eight only to lose it one lap later to finish second to Nelson with Walters in third and only .6 seconds separating the top three. In one of the closest heats of the night eleven seconds sperated the field of nine over the ten lap race. Places changed constantly during the heat with the car of Leahy taking the lead on lap two and the minor placings being decided by lap six with the final placings Leahy, Cockerill and Burr setting the scene for a barn burner of a final. Twenty one cars lined up for the final and, after the formalities of driver presentations, set off for 35 laps to determine the Victoria #1. MDA 18 Jake Drewett got a holeshot on the field at the flag and looked strong but was challenged on lap 8 by the MDA 72 of Martin Hawson who took the lead. By lap twelve the cars of Matt Gerlach and Russell Felsavory were infield followed one lap later Rachel Pratt, Russel Bent and the reigning Victorian #1 Aiden Raymont followed shortly after by Graham West all from contact. This left a wide open track for the field to battle for the title. Leader Martin Hawson was also involved while leading but continued on. Above - Victoria #1: Horsham’s Daniel Simpson celebrates his win in the Victorian State Title at Blue Ribbon Raceway. Photo Courtesy of Jamie Collins.